I DVR a lot of TV. Mostly interview shows and music shows and a ton of Book TV. And Around the Corner with John McGivern. I listen more than I watch. On a Sunday, a few days before my Grandson Noah Klein was born, I was startled to see my Grandpa on TV! I was catching up on a few episodes of Around the Corner. I was particularly enjoying this one, an hour-long special with John Gurda. John Gurda wrote a few books I read for a class enjoyed at UW-Milwaukee, “Milwaukee, Yesterday, Today & Tomorrow,” taught by Frank Zeidler, the last socialist mayor of Milwaukee. Roughly two-thirds of the way into the episode, Gurda and McGivern went from Milwaukee to Chippewa Falls. That’s where my Grandma Mabel and Grandpa Reuben Klein were from, and where they are buried. Reuben Klein Logging Northern Wisconsin. Grandpa Klein is standing on the second log up. Find the fellow in the right-foreground resting a hand on a handle. Reuben Klein is the man directly above him. Sure enough, there was Reuben Klein! My Grandpa, in the exact same picture as the framed 8 x 10 within arm’s reach of my chair on the wall in my home office! I was overwhelmed, watching it over and over. (Still have it on the DVR, even though I have the web link.) I’ve shown it to everyone who will look. I thought about it the night Noah was born. His grandfather’s grandfather was on TV! I’m lucky to have a few 8 x 10 pictures from that lumber camp. One photo is that of the half-underground, sod-covered structures that were the heart of the camp – the cook shanty / mess hall and the barracks . The other photo (also framed on my home office wall) is that of just one other fellow and my Grandpa. They have about a ten foot, double-handled saw blade halfway through a four-foot diameter tree trunk. Ice hangs from the other fellow’s mustache. Grandpa’s flannel overshirt is open halfway down the front, no doubt because they were warm from the work. Those pictures remind me of the stories I heard from Grandpa, and later Grandma Klein and my Dad, Lloyd Klein. Grandpa was about 18 in those pictures. He stood 6′ 6″ and weighed 250 pounds without a hint of fat on his frame. He worked from sunrise to sundown for $1 a day. There are more stories I’d like to share one day. Tune in at the 41 minute, 11 second mark in this video to pick up on the Chippewa Falls segment. That’s where my interest picked up from the audio (wonderfully done throughout) to the audio and video. At about 43 m, 12 s, the conversation turns to the historic lumber industry in Wisconsin. I love listening to all of this portion because the lead-in to my Grandpa’s photo rings so true of the history I’ve heard. This is where Paul Bunyan was born. These lumberjacks were Wisconsin’s cowboys. Fascinating history here. At one time about a thousand saw mills in Wisconsin. 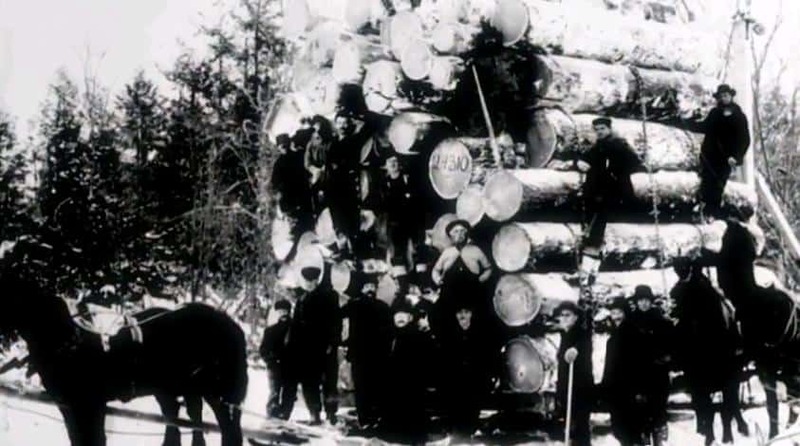 By 1890, a quarter of the wages in the entire state were paid by the lumber industry. Reuben Klein appears at the 46:26 mark in the video. Thank you so much John Gurda. You too, John McGivern. Your show is wonderful. You made this grandson’s – and new grand-dad’s – day! This entry was posted in Family, Favorites, Media, Noah, Reuben Klein and tagged Lumberjack, Reuben Klein on July 27, 2014 by keith.